Fourteen down, three to go. The Carnegie Library of Pittsburgh (CLP) is continuing its long list of branch renovations with its Knoxville location, which will close June 27 to begin construction. The library is one of the last in the CLP’s Capital Improvement Program that began in 2003, which aims to renovate every neighborhood branch in the Pittsburgh area. Located on Brownsville Road, the Knoxville branch “is not an inviting-looking space,” according to Mary Monaghan, assistant director for neighborhood libraries at the Carnegie Library of Pittsburgh. It’s got concrete walls, it doesn’t offer much natural light, and its lower level is not accessible for people with disabilities. Walking past it, “a lot of folks will not even realize it’s a library,” said Monaghan. The Carnegie Library of Pittsburgh and GBBN Architects met with Knoxville community members and organizations to get their input on what they want to see done to the building. Monaghan said through these renovations, they wanted each library to reflect the neighborhood in which it’s located. “All of our renovations have included a long community process where we, a year before we even begin construction, sit down with members of the community and community groups and sort of say, ‘What’s important to you? What do you want your library to look like?’” she said. The Knoxville plans include a new teen and young adult room, two community meeting rooms, and an updated children’s reading nook. The building will also include more windows to let in natural light, a feature of the renovations that has been crucial in the other branches. Monaghan said she’s most excited about the outdoor patio that will connect to the new children’s area. “We can do some programming outside, so that the kids can just read outside…It’s a safe space, it’s enclosed, but it’s a nice outdoor space for the kids to use,” she said. The building will also include a new elevator, making it fully compliant with the American with Disabilities Act (ADA). The project’s $3.2 million budget is mostly funded by the Carnegie Library’s capital campaign Libraries for Life, which is a combination of corporate and individual donations. This project also received a $500,000 Keystone state grant this spring. The Beechview branch has been under construction since last year, and its grand re-opening celebration is scheduled for July 18. The two branches awaiting improvements are Carrick, which will begin its renovation in 2016, and Mt. Washington. The Carnegie Library has seen a sustained increase in use of every branch that has been renovated, according to Monaghan. She said these renovations will help libraries reconnect with former patrons. “Folks who had forgotten about the library, folks who stopped going when they were in high school or college or when their kids grew up – it reminds them of how special the library is and how important it is to their life, and it brings them back and they stay back,” she said. The Knoxville branch will remain closed until next summer. While the renovations are happening, the library encourages Knoxville residents to use the nearby Carrick or South Side branches, or any of the branches in the Pittsburgh area. Grab your capes and grab your books: a superhero book club is headed your way. Pittsburgh City Council will take a final vote Tuesday to approve a $500,000 state grant to renovate Knoxville Library. The Keystone Recreation, Park and Conservation Award would help cover the costs of adding a second public meeting space and a new teen area to the library, as well as structural updates to comply with ADA accessibility mandates. According to the Carnegie Library of Pittsburgh Assistant Director of Neighborhood Libraries Mary Monaghan, the Knoxville branch was built in the 1960s and hasn’t been renovated since. The Carnegie Library of Pittsburgh’s West End branch might be a historic landmark, but its story is still being written. The library will reopen to the public Saturday after a seven-month, $1.7 million renovation. The library is inviting the community to the grand re-opening celebration, which will, among other things, include self-guided tours and 3D printing demonstrations. People often think of the library as a place to sit quietly while reading or studying. 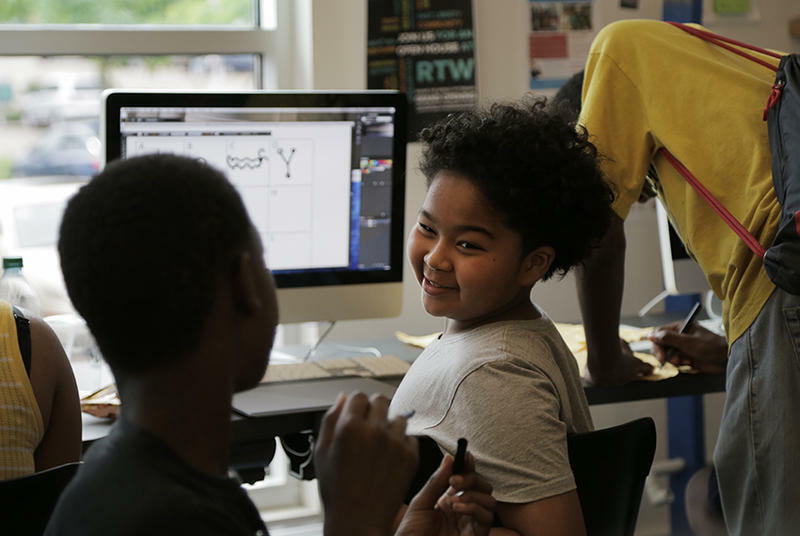 But the Carnegie Library of Pittsburgh is challenging that stereotype by turning the library into a creative hub for teens. It was the second week of June, and Pittsburgh Public Schools had been out of session for two days. And yet, half a dozen teenagers and pre-teens were sitting around a table, enthusiastically engaging in a lesson about ancient Egypt. “Because they were on the Nile River they could have had a good water supply,” answered 12-year-old Jonathan Freeman, clearly familiar with the concept. Freeman and the other teens weren’t at summer school; they were at The Labs at the Carnegie library’s East Liberty branch.